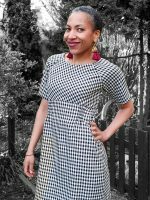 The Tulip Dress started life on my website as a free pattern and was very popular. However, after 3 years of downloads and many requests, I have finally converted it into a multisize pattern. 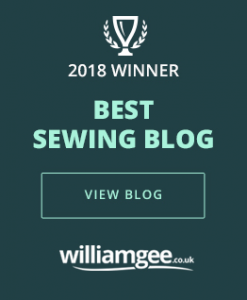 I have improved the fit and cut from it’s original super-simple 2 piece pattern – you can find the details of the new pattern here. I made it originally in a pretty black spotty fabric and kept it very simple (I know what you like!) But, here is version 2: I couldn’t resist making some slight changes and renaming it Tulip dress with colourblock! 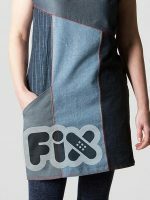 The fabric is slightly less drapey that the original spot and you can see that it holds its tulip shape more strongly. The exaggerated curve on the skirt is really clear. It is shown here made from a red and grey check cotton (that is actually a Burberry shirting), combined with a slightly heavier red satin. Both fabrics are from Fabworks online. The sleeves are finished with bias binding made from the same satin. If you wanted to add this colour block in yourself, you just need to cut a line about 20cm up from the bottom of your pattern on both the front and back. Cut these shapes out of fabric and join your 2 pieces of coloured fabric to the main part of the dress. 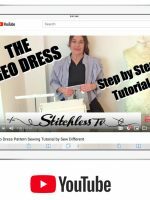 Do this BEFORE you try and sew the back and front of the dress together. And as a little extra feature, I also put a notch into the neckline. I thought it echoed the V of the front pleat in a pleasing way. 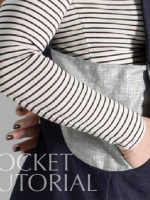 This detail is not on the pattern though – you would have to create it yourself if you wanted it. 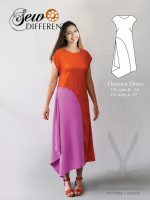 I am not going into details here, but if you felt confident enough to try it, you would just finish it with bias binding in the same way as the rest of the neckline. I’m going to try this with some pretty quilting cotton. About how long would this dress take to make? Also, is there an option to make it sleeveless? I have just found your site (by accident) while searching for shops around Bradford that have Fent sales). I have saved you in my favourites as i need to come back a read some more when i have more time. 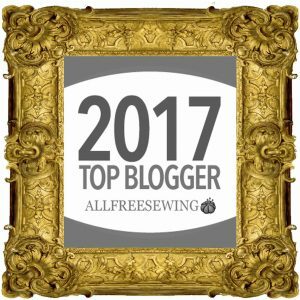 so much information, really great tips AND free patterns-Thank you! I really like what I’ve seen so far. I am going to continue looking. The pattern was free for the first 2 years but has now been converted into multisize pattern. Sorry for any disappointment but there are other free patterns under the resources tab on the website.